The cemetery was the burial ground for patients and staff of the former Hill End and Cell Barnes mental hospitals, but the ground was not consecrated. Patients were only entitled to a pauper burial, meaning that they were laid to rest in mass graves without a headstone. These were located by a numbered plaque and the burial register between May 1899-February 1948 shows 1,019 burials in 179 graves, meaning 8 or so bodies were in each grave, one on top of each other. Those who died would have been buried in an unmarked grave after a hurried ten-minute ceremony. After 1933 burials included those from Cell Barnes Hospital. No burial register has been found to-date for burials after 1948. 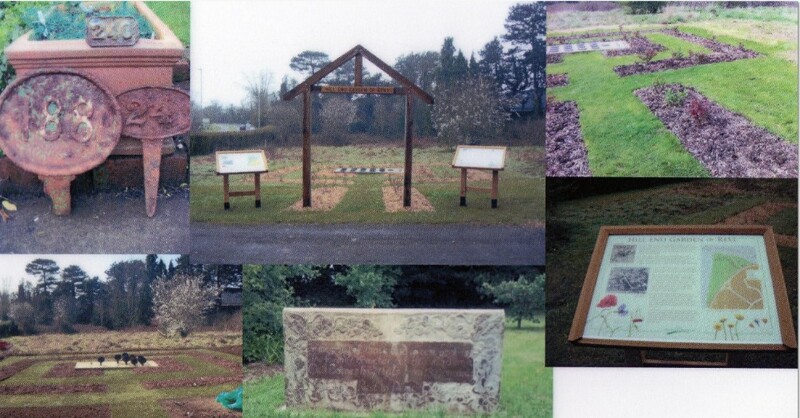 In February 2008, investigations showed the location and orientation of graves and also some grave markers. From the numbering it was possible to infer the location of further graves and a survey was able to determine the probable extent of the cemetery. It is suspected that only a proportion of these markers remain on the site. During World War II, Hill End served as a military hospital run by St Bartholomew’s. No military patient who died at the hospital would have been buried here as they would have received a standard military burial with a War Graves Commission gravestone. No such stones have been found. Using donations collected from Highfield Park Trust Summer Fetes, a local artist – Frank Casey – was commissioned to create the excellent sculpture just inside the entrance from Hill End Lane. “In memory of those laid to rest here in the former cemetery of Hill End and Cell Barnes Hospitals from 1899 onwards – Rest in Peace”. A memorial arch has also been erected and rose bushes planted. The metal numbered grave plaques are now seated in concrete to prevent vandalism. The burial site has been designated, and is maintained, as a wildlife meadow. The last burial was in 1963 and in May that year it was decided that in future the Hill End cemetery would only be used for the scattering of ashes following cremations. Cremations cost £20 and would be recommended to patients. If a patient wished to be buried, the public cemetery (in Hatfield Road) would be used, a burial costing £11. After taking legal advice, the Committee had all the headstones removed* from the Hill End cemetery and renamed it the ‘Garden of Rest’. *Eight visible headstones still remain in the Garden of Rest including those for Emily Evans, Muscot Atkin Lomas and two (!) for Samuel Alderman Lomas – though these are not in situ. Most inmates would have been encouraged to attend services at the Chapel every Sunday (Rules and Regulations 1930-31). This attendance seems ironic in view of the fact that upon burial the ‘paupers’ were consigned to an anonymous, overcrowded grave. All but the most feeble minded would have been aware of the cemetery a stone’s throw for the Chapel and the fact that those who died would be buried there after a hurried ten minute ceremony in an unmarked grave.